I love new years. It always feels to good to turn the page and have a shot at a fresh new year. And new years in New England is always so so cold — which I think really helps mark the beginning of the real part of winter and the turn of the year. Even when it’s warm right before new years, as it was this year, it always manages to get super freezing when the time comes. Which brings me to pond hockey. Today, we went to visit some friends who live near Lake Boon in Stow, Mass, which is about 45 minutes west of Boston. Amazingly, because it was so warm and rainy last week, and then so cold this week, the lake got a natural Zamboni treatment — so all 163 acres of it are not only frozen solid but also smooth as can be. I spoke with a woman who had just finished up hockey with her family — she grew up in the area and said that in her whole life she’d never seen the lake like that. It’s was unbelievable, really — launching from the town beach and skating as far as you felt like, around the edge of the lake or straight across it. There were tons of people out on the lake — a bunch of pick up hockey games (our friends counted 5 separate DIY rinks marked out around the lake), people just taking a nice tour, and even a guy riding a motorcycle back and forth across the middle (amazingly). I’ve written before about why casual & natural is so awesome, and today’s experience totally confirmed my view on that. 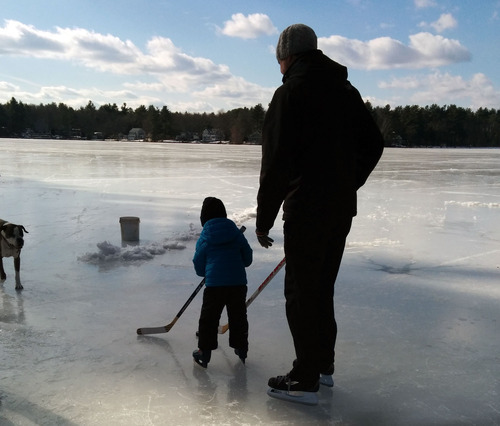 Being able to skate around, wherever you like, however you like, passing around a puck and buzzing around the lake: unbelievably awesome. So so much more awesome than skating at a skating rink — which is also fun, but so much less fluid, with so many more rules, and so much more formality. You’ll notice in the picture that our friends brought their dog out onto the lake. How awesome is that? I think about this idea of the casual / integrated version of a thing, vs. the formalized version of it. I don’t know why I feel so strongly about this, but I feel so much magic in doing things the casual way. For example, riding your bike to pick up some groceries, vs organizing a bike ride. Or skating to work along the Ottowa canals, vs going to a skating rink. I just love the way fun activities like that feel when they are blended into your daily routine, rather than an event that has to be organized, or done at some special single-purpose facility. Anyway, it was a great way to start off the new year. I feel refreshed and energized and ready to skate off into 2014. Here’s to an excellent 2014 everyone.